Following entrance to multiple markets in the United States, Chariot is launching its daily commuter shuttle service in London, to make getting around the city easier. Designed for city dwellers who live in harder-to-serve areas where public transport is not easily accessible, Chariot enables passengers to complete the first and last mile of their journey faster and more comfortably by connecting them with nearby transit hubs and underground stations. Service in London kicked off this week with four Chariot routes designed to complement the city’s existing public transport system. “As well-served as London is by public transport, the daily commute can still be a bit of a slog for some in the city. 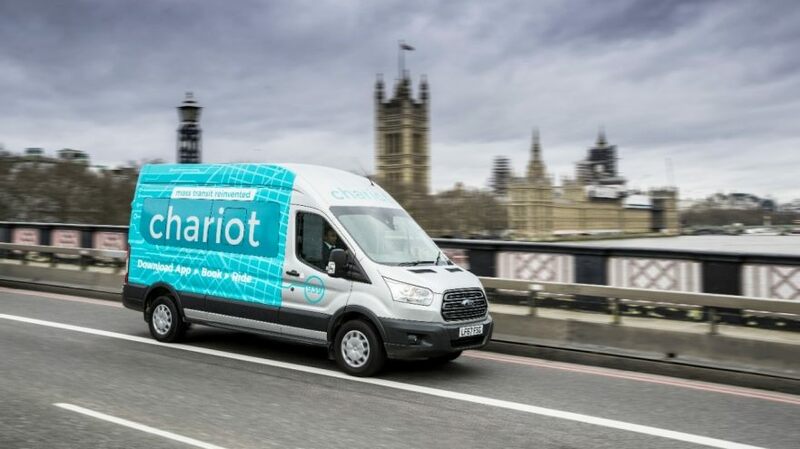 Chariot is one way of providing residents with reliable, safe and affordable transportation,” said Sarah Jayne Williams, director, Ford Smart Mobility, Europe. Four London routes, informed by a detailed analysis of urban areas, are designed to connect commuters living in densely populated areas to existing transport networks. The routes will help fill transportation gaps between several rapidly growing neighborhoods and six London transport hubs: Clapham Junction, North Greenwich, Abbey Wood, Kennington, Vauxhall, and Battersea Park; and will also help commuters with their onwards journey on the Victoria Line, Northern Line, London Overground, National Rail – as well as Thames River Boat Services and the Emirates Cable Car. From now until Feb. 14 commuters will be able to use the service for free, on a first come first served basis, by inserting voucher code HELLOLDN in the payment section. Then, with a monthly pass, single journeys cost from £1.60, with single pay-as-you-go rides £2.40. Up to six shuttles per hour will run at peak times, with 14 fuel-efficient minibuses. The 14-seater passenger shuttles will be able to use London’s bus lanes, offer Wi-Fi, air conditioning, and overhead storage for laptop bags and briefcases. Selected shuttles will be wheelchair accessible at launch, and the professional drivers will be trained to assist passengers with special needs. Chariot is accessed via a smartphone app that enables users to search for a nearby route and the closest available transport hub address. The app – offering dedicated customer support – will then locate the nearest convenient pickup point. Passengers can book a seat and track in real time the progress of shuttles that run Monday to Friday, during the rush hour. In addition to a commuter service, Chariot is exploring enterprise and charter services in London and has also been accredited as a Living Wage Employer by The Living Wage Foundation. The voluntary commitment will see everybody working at Chariot in London, regardless of whether they are direct employees or third-party contracted staff, receive a minimum hourly wage of £10.20 – significantly higher than the statutory minimum. London is the sixth city to be served by Chariot, which operates in the U.S. in San Francisco, New York, Seattle, Columbus, and Austin. The ride sharing service has the potential to be a part of measures aimed at tackling both congestion and air quality issues, and to address gaps in the transport system and completing commuter options. Altogether, the company runs 108 routes daily and plans to expand to additional cities both in the U.S. and internationally.